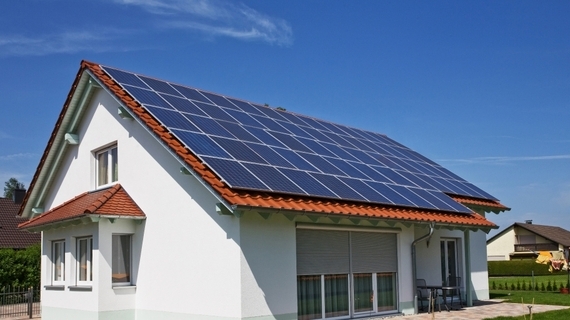 Homeowners should install green energy before the end of 2016 for a 30 percent tax credit. Green energy sources, whether geothermal, wind turbines or solar photovoltaic systems, provide an opportunity to homeowners to lower bills, embrace energy efficiency and apply renewable power options. Expert installers say homeowners considering renewable energy need to act quickly to take advantage of federal tax credits. The 30 percent tax credit for wind and geothermal systems applies only to systems installed prior to December 31, 2016. The solar tax credits have been extended but still shrink as the years go on. Solar systems placed in service by December 31, 2019 receive a 30 percent tax credit. The credit reduces to 26 percent in 2020 and and 22 percent in 2021, and is eliminated entirely after December 1, 2021. As one of the most visible and common means of green energy, solar power represents one of https://www.angieslist.com/articles/solar-power-should-you-go-grid-tied-or-stand-alone.htm. Jason Bassett, owner of Arrow Roofing & Solar in Murfreesboro, Tennessee, says the average home uses 2,000 kilowatt hours of electricity per month, and a $25,000 solar system can offset most of that, with the homeowner recouping that investment through energy savings within five to seven years. "The cost of solar has gone down a lot in 10 years," Bassett says. "When I started doing solar, the cost of an installed array was between $7 and $8 per watt. Now it's between $2.50 and $3.50 a watt. You're getting more out of your dollar, and competition has really driven it. It's not just a fringe thing any more. People have a desire to be more green." He adds that most solar systems carry warranties for 25 years and should last between 30 and 40 years. "After you get past your payback period, it's pure profit," he says. "There's no downside to the investment." Remo Eyal, CEO of Superior Solar Systems in Altamonte Springs, Florida, points out that solar power frequently generates so much energy that it feeds the excess power back into the grid. "Your meter is running backward and reducing the bill," he says. "The power company is paying you for the energy you're providing." To read more about green energy options, read the original article Green Energy Options Offer Electrical Savings here. This article originally ran on Angie's List and is part of a series on the topic of electrical energy. For more information about Angie's List, visit AngiesList.com.